I can’t believe another month has passed and we are in March already. Finally, Spring maybe just around the corner after what seems like a very long Winter! I’ve been relatively good with my spending this month as I’m saving up for a few bigger purchases, but I couldn’t go the whole month without having a few little treats. So this is what I’ve loved using during February. No7 Metallic Eyes Pencil in Green. This is a bright metallic green and is a colour I would never have looked at before but I was in the mood for experimenting! The pencil glides on smoothly and didn’t drag my skin. I absolutely love this colour. No7 Stay Perfect Eyeshadow singles in Matte Mocha and Khaki Shine. These lasted for hours and blended smoothly. The colours went perfectly with the eyeliner and are easy to apply. I’ve had to replace a few eyeshadow brushes as my old ones were beyond repair (they were 10 years old!). So I made use of my Boots Advantage Card points and thought I’d try out the Real Techniques 200 Oval Shadow brush and the 201 Pointed Crease brush. 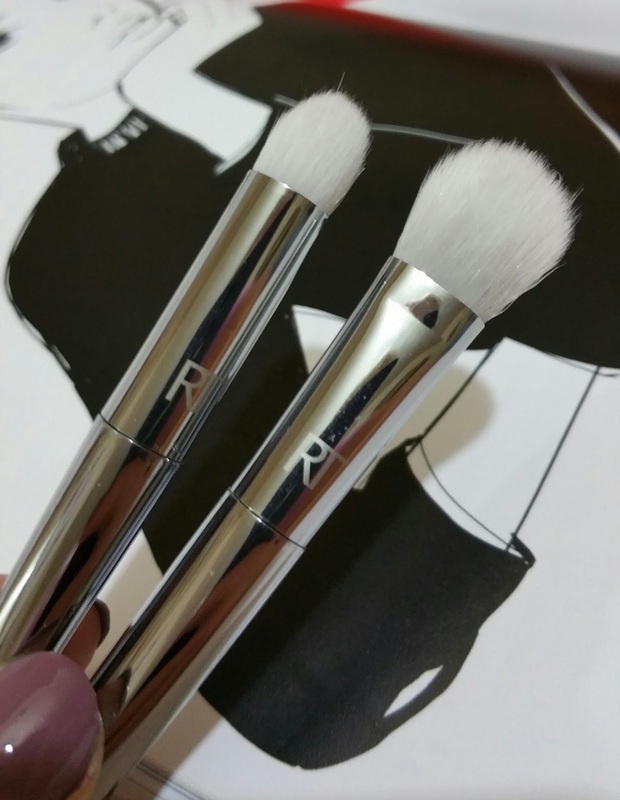 These brushes are brilliant, I’ve loved using them. The bristles are so soft but strong, and they make it really easy to apply my eyeshadow just where I wanted it because of their shapes. The oval shadow brush fitted perfectly over the whole of my eyelid and the pointed crease brush was great for applying the eyeshadow in the corners and the crease. They cleaned up lovely too. I think I’ll definitely be investing in some more of these soon. I’ve always been a big fan of Barry M nail polishes and these ones were such gorgeous colours. With the Daylight Curing nail polishes you don’t need a base coat and with the topcoat they are as tough as gel nails without going through all the hassle and expense. They were easy to apply, the nail polish looked really glossy and lasted for ages. I’ve really loved wearing these. This was given to me by a friend at Christmas but I didn’t start using it until the end of January. The hand lotion smells amazing with rhubarb and juniper and it’s bright snappy smell is perfect for applying in the morning or throughout the day. My hands get very dry, especially during the winter, but this lotion leaves them feeling really soft. I really love it and it has to be one of my favourite hand lotions as well as one of my February favourites! I was looking for a high heel shoe that was a little bit different to the ones I’d normally wear. I saw these in New Look when I was browsing a few weeks ago and I fell in love with them as soon as I saw them. The lace and cut out detail make them easy to style with an evening outfit but also adds a bit of interest to an otherwise plain day time outfit. I’ve worn them with so many things that they most definitely deserve to be in my February favourites. I hope you’ve enjoyed seeing what my February Favourites are. What things have you loved using during February? Have you used any of these products? I’d love to know what you think.